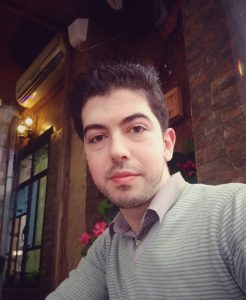 I decided to study medicine at university, because being a doctor means the future is full of hope, the hope that I can give it to people and make them suffer less from their diseases or injuries. Once I achieve my degree and my internship in Gaza, I will specialise in brain surgeon. It’s a specialty that can help people here in Gaza, because people often have to travel to receive treatment and while people waiting for referrals and visas the diseases can get worse. I want do research and studies that related to this field and try to add something to it, something that will make the humanity suffer less and giving it the hope. Unfortunately last year, my father died leaving me and my mother and 3 brothers. We live in a rented house, neither my brothers nor me nor my mother work and the only source of income is my father salary from the government. Two of us are studying at IUG and the other two are still at school. The tuition fees are very expensive and I was worried that maybe I could not continue with my dream of becoming a doctor. Thank you for this money. We are all so happy that I was chosen. It helped me to enrol for the next semester at IUG, helping me to continue my way to becoming a doctor. We partner with The Madrinha Trust on undergraduate scholarship. Since this partnership began, they have sponsored 15 of our students, 5 of which have graduated and are now working in Palestine. This event was aimed at updating everyone on how the mentees were doing and demonstrating the success of their new buddying-up scheme, which adds another layer of support for the students by partnering them with former mentees. Both the mentees and the buddies offer vital support, giving the mentees confidence to thrive. On 24th November 2015, I was accepted to do an elective in Oxford in July 2017. It was the most wonderful thing I have ever heard. I didn’t realise then that my way would be difficult. My first visa expired before I could leave Gaza, because Rafah crossing was closed in June and July. I was offered a new position in November 2017, but again I was unable to reach Oxford, which was a real shock! 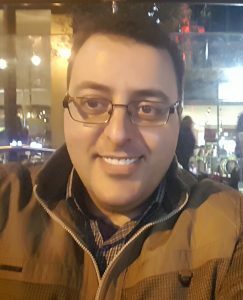 Finally, I managed to leave Gaza in 16th December 2017, but I only had two weeks left on my second visa. I had to try and figure out whether I could go directly and extend my visa from there. As it was nearing the Christmas break this wasn’t possible, so I decided to go to Jordan do an elective and reapply from there. It was my first time outside of Gaza after many failed attempts. I was enthusiastic and, to be honest, a little afraid. Being away from my family is so challenging, but also I am working in two ways, the first is to do elective in Jordan, and the second is to get a new visa for the UK. In Jordan, I did 1-month-rotation in the Surgical Department in Jordan University Hospital under the supervision of Dr. Nader Al-Bsoul. It was my first time to scrub in as an assistant in thyroid surgery and it was really amazing to participate in such delicate surgery. I also took part in sessions with other Jordanian students who became friends and we have many trips together. It was my first time to form connections with non-Palestinian individuals and it feels good to have discussions with them about common problems Arab are facing nowadays, about medical schools and our plans for the future. On the other hand, I was working really hard to get a new visa to join the elective programme in Oxford. Everything was going very well until I unexpectedly was refused. At that moment, everything turned upside down. I was so upset, those days were hell-like. After 3 days, Rafah Crossing opened again and I travelled back to Gaza. Despite many challenges and problems and the fact that I failed to reach Oxford, I am really proud. I am one of few medical students who took the risks and travel to pursue their dreams despite the political situation around us. Not being able to go back to Gaza and attend my final exam and graduation ceremony were my greatest fears. This journey added a lot to my personality and my thoughts. I took responsibility of my whole life from A-Z. I can say now that I am more confident and daring. 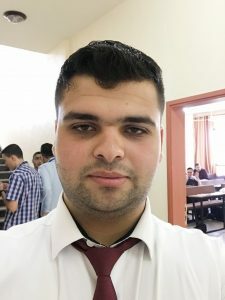 From a scientific and practical view, I realized that medical graduates from Gaza’s universities are rival to those from other countries and they can compete very well. I always remember the quote that says, “It is a rough road that leads to the heights of greatness”; so do not expect your way to be easy, you have to fight for your dreams. We, at FQMS, are gearing up to the busy time in our calendar. The annual FQMS fundraising dinner is on Friday the 2nd March 2018 in Central London. The dinner planning committee is led by Dr Ahmed Massoud this year and he already has his hands full. This year many of the elective students from Palestine were unable to travel for various reasons. The UK visa requirements have become more stringent and none of the 6 students I expected in our surgery department at University College London Hospital made it. The situation for the Gaza students has been as difficult as ever, as the closure of the Gaza strip continues. The few students who managed to get out then had delays of many weeks trying to get home. This was also the case for the IUG Medical School Vice Dean, Dr Anwar Al Sheikh Khalil, after attending a conference FQMS supported him with. 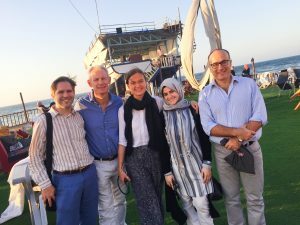 On a positive note our partners, the Oxford University Surgeons and Physicians were in Gaza in October on their annual teaching week. Not only do they deliver excellent teaching, they also give the students and faculty a much-needed show of moral support. A message that they are not forgotten. Of our most recent postgraduate trainees, Dr Najib Salameh has embedded smoothly into the department of Obstetrics and Gynaecology at University College London and Dr Maha Akkawi is enjoying her training at Southmead Hospital in Bristol. The partnership we have with the Madrinha Trust continues to blossom. We are very grateful to them for providing 4 new full scholarships to medical students from Al Azhar Medical School in Gaza. These very generous scholarships cover existing debt as well as future tuition fees. A further student has been sponsored fully by a donor who wishes to remain anonymous. I have succeeded in convincing a key Madrinha trustee to join Dr Lina Nashef and I on our upcoming visit to the West Bank. Sui Chin McKeand will meet the deans at Al Quds and An Najah MedicalSchools in Jerusalem and Nablus respectively, plus doctors financed by the Trust in the past. The AGM this year was held in October at Dr Jeanne Frossard’s beautiful home in Maida Vale. On a final note, we are so delighted for our trustee Dr Rawya Charif who got married recently. Alf mabrook (a thousand congratulations) Rawya! I look forward to seeing you in March. Please keep us in mind for your charitable donations. Our website has an easy “DONATE” button. Trustees of FQMS deeply mourn the loss of our major benefactor, Mr Abdel Mohsin Al-Qattan. Mr Al-Qattan touched many; over decades he established and championed many institutions and charities. He was a unique man of quiet dignity, resolve, dedication, discipline, high values and inspiring generosity, who expected the highest standards of himself and others. Yet he also showed empathy, sympathy and humanity. He was highly able and knowledgeable with a deep understanding of the history of the Arab world and of current affairs. He loved Arabic poetry, especially Al Mutannabi. His courage was unfailing and he spoke the truth even when against the tide. This courage shone till the end, a solace to his family and friends. Allah Yirhamo. He will be sorely missed. May his legacy to Palestine live on. In 2017, we have supported four trainees: Abeer (Pathology), Alaa (Paediatric Cardiology), Naji (Gynaecological Oncology), Maha (Haemato-Oncopathology) and Najib (Laparoscopic Gynaecological Surgery). The latter four are part of the Juzoor/Arab Fund Partnership. Here, in their own words, are updates from Naji, Maha and Najib on their time in the UK so far. I came to UCLH six months ago. When I met my supervisor he designed a schedule, to integrate me in the new system. I work in the labour ward on Mondays, where the protocols and guidelines of the Royal College are strictly followed. What impressed me most is the teamwork in the labour ward. You can sense a rhythm among consultants, registrars and midwives. For the rest of the week, I either cover clinics in urogynaecology and endometriosis or assist in theatres. UCLH is one of the most prestigious endometriosis centres in the UK. They deal with complicated cases, especially rectovaginal disease. This is expanding my experience in both pelvic anatomy and laparoscopy. The consultants are very keen to teach me and I’m learning something new every day. UCLH is a lovely place to learn. I’ve been in London a year and a half. When I’ve arrived in London, I wasn’t sure about the level of training I was going to have, but it has more than lived up to my expectations. In the beginning, I struggled adapting to this new system. My surgical skills have improved greatly. Following up on patients and our weekly MDT, have widened my experience in planning and executing surgery well. My main goal was to improve my laparoscopic surgery skills. After a year, I can perform this type of surgery safely, but I need more experience to be able to do it independently. My time is limited, especially as this is a big and complicated subspecialty, but the team has been friendly and helped my confidence and skill grow. I hope I’ll be able to achieve what I wanted to when I made the decision to quit my job in Palestine and train in England. Starting a new life in a different country, a different continent and indeed a different culture is not an easy step, especially when you have a family with you. To settle into a new place, new home and new rules and regulations is a big source of anxiety, but over time you start to relax, which is when I was ready to begin my training. Becoming a part of the haematology-haematopathology team was peaceful. I was welcomed by the team and introduced to working straightaway. But when you open the door to so much knowledge there can be some storms to face, but luckily I was able to overcome them. Day by day I started to become more familiar with the routine and work. I started to get involved in educational activities. What really helped is that North Bristol NHS Trust is one of the core haematopathology centres in the south of England. I am lucky to be part of their team. Now after a year, I’m beginning to feel that I’m advancing my skills and helping me lay the foundation for my return to Palestine. My hope is that I will be able to help create a haemato-oncology service in Palestine with up-to-date applications and diagnostic methods. They say “dream big, work hard, stay focused and surround yourself with good people” and I think that is my secret. Well, it’s not secret anymore! This year we have so far helped to fund 128 student electives in North America, Europe, the Middle East and North Africa. Electives are available to students from Gaza, but increasing border restrictions have meant that only 4 students have made it out so far. This year with the help of the Asfari Foundation and the Bryan Guinness Charitable Trust, your donations helped us continue to provide 7 temporary loggings for more than 250 Al Quds Medical School students. Last year, we started part funding a bus to take students from the Islamic University of Gaza to their new campus outside Gaza city, which used to cost the students about $10 per day. The students have found this very helpful, as the bus makes it easier to get to campus. They hope that there will be more buses, to reduce waiting times. Currently, the bus can take 40 students per trip. The money is in place and we await funding for doctors wishing to train in the UK, so recruitment can begin. Thanks to the Bryan Guinness Charitable Trust we funded over £6,000 worth of clinical skills equipment for The Islamic University Medical School in Gaza. This will be used by more than 600 students. These laboratories are in constant use and much of the equipment was out of date and dilapidated. As an example, the gynaecology models allow for teaching of pelvic, cervical and obstetric examinations. We also funded a photocopier, laptop and printer, for Al Azhar Medical School in Gaza. We raised £24,000 which was divided equally amongst the 4 medical schools,. These bursaries are for talented students, with higher than average scores and broad ability, who are also in extreme financial need. This year 36 students benefited, receiving $564 – $1,380 dependent on need, with the funds helping to pay fees and living costs. When I was presented with the idea of completing my fellowship in renal medicine in the UK, I was overjoyed. FQMS provided me with a golden opportunity to advance my career and for that I will be forever grateful and indebted. There are quite a few differences in medical training and practice between the UK and my homeland Palestine, which might be partially attributed to the obvious difference between developed and developing countries. Namely, there is a lack of formal training in sub-specialities in Palestine despite the massive need and demand. Statistically, the number of patients with kidney problems, failures and transplants is on the rise. However, patients usually have no other option but to be put on a long waiting list for referral to Israeli or Jordanian hospitals. If they are really lucky, they can afford to travel abroad for their necessary medical treatment, which is rarely the case. Palestine is not short of bright minds, but it lacks resources and training facilities, which has left it in desperate need of sub-specialist physicians. I cannot begin to express my gratitude to FQMS, as their support has changed the course of my life. Had I stayed in Palestine, I would have been confined to the patriarchal society’s norms and would not have been able to advance my career in the same way due to the complex situation, specifically the siege on the Gaza Strip. 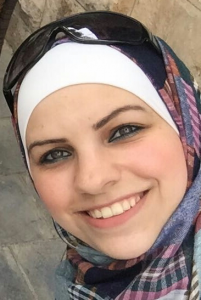 The fellowship has provided me with a well-rounded experience, including both theoretical and practical experience, which is much needed in the Palestine. There is a wealth of experience in taking care of kidney patients and performing procedures, like dialysis, line insertion, and biopsies, as well as leadership and management skills. Combined together lead to improvements in treatment and the maintenance of good medical standards. Developing my career as a nephrologist in the UK has been a great journey. This wouldn’t have been possible without the support of FQMS. 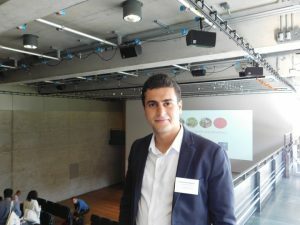 “Thanks to the generosity of FQMS, I was able to present my poster, “Migration and Health in Middle East: Challenges and Opportunities” at Oxford Global Health and Bioethics International Conference (Ethox). Abdelrahman’s poster focused on the many deficiencies in the provision of primary healthcare for refugees who are internally displaced or those who migrated to other Middle East Countries. 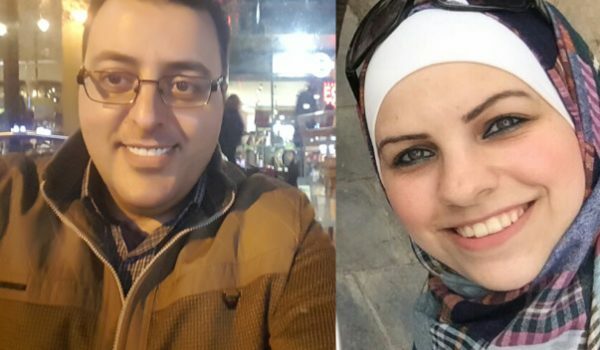 The shortage in healthcare delivery includes inadequate antenatal care for pregnant women, as around 52% of advanced cancer patients among refugees in Lebanon and Jordan have not received treatment. The data also showed that there is a deficiency in following up on the psychological effects of war on refugees. The paper made a number of recommendations, most important of which is paying more attention to refugees’ antenatal care and increasing the support to psychological and healthcare programmes provided by the Office of the United Nations High Commissioner for Refugees (UNHCR). 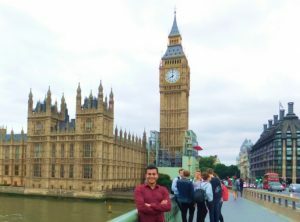 For Abdelrahman, “This was one of the greatest experiences I ever had,” as he “had amazing time exploring the university of Oxford, meeting its Professors and coaches and to discover some parts of the beautiful London for first time in my life”. This opportunity not only enabled Abdelrahman to present his poster at this global forum, but also it allowed him to expand his research network and as a result he received an offer to publish his paper in the highly-ranked journal, “Global Bioethics”.